The weekend also brought the Austrian edition of the European Heritage Days which means that all over the country the Denkmalamt (State office for the preservation of monuments) provided guided visits to a wide array of historical sites and monuments, some of them well known but most them rather overlooked and usually not accesible to the public. 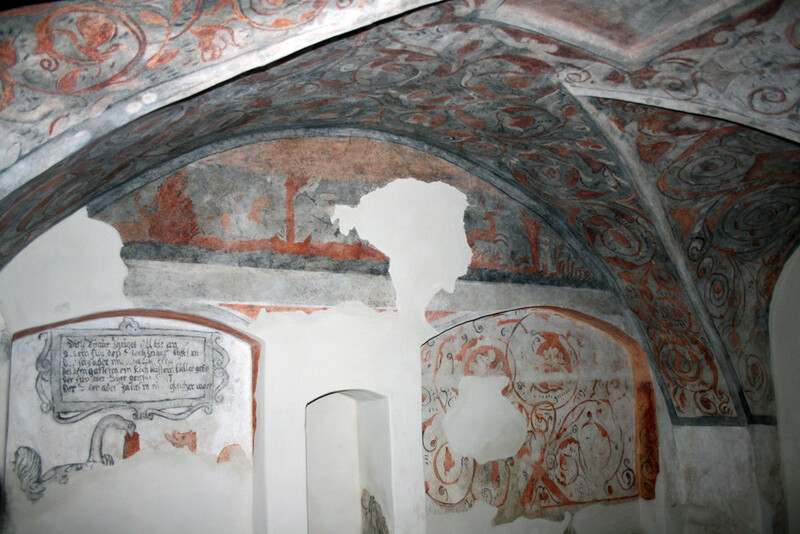 So despite the ghastly weather we went on a Sunday outing, succumbing to the lure of some recently discovered 16th century wall paintings in Kaiserebersdorf, a village now formally part of Vienna but, historically speaking, an independent community on the outermost outskirts of the city. Here, in a room of the old village smithy a painted decoration dating to ca. 1580 was uncovered under more than 60 (!) more recent layers of whitewash and paint. Since [m] and I are primarily medievalists these murals are, of course, slightly out of our time range. In the context of rural Austria they actually pass for “Renaissance” art. 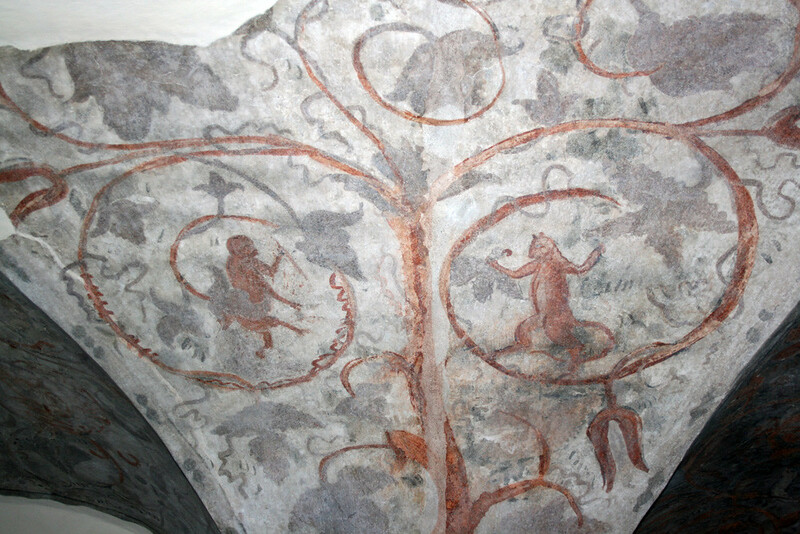 On the other hand, they’re still very much in the tradition of medieval domestic painting: For instance vegetable scrolls and tendrils interspersed with the figures of birds and beasts, as found in the vaulting at Kaiserebersdorf, had been a common motive at least from the late 13th century onwards. Also, one of the smithy’s most interesting paintings, depicting the Aesopian fable of the fox and the stork, forms part of a very long pictorial tradition: Aesop’s fables as subjects of domestic painting are documented as early as the 11th century and were quite widespread during the later Middle Ages, with surviving examples diffused all over central Europe, from the Valle d’Aosta to Slovakia. 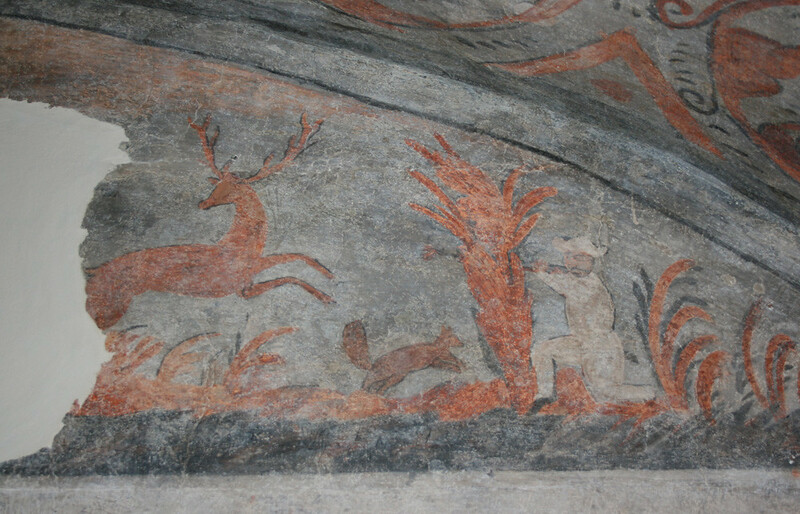 And there is, of course, the stag-hunt – the most popular subject in secular wall painting all through the Middle Ages. Back then hunting was a privilege of the nobility, and the stag was considered the noblest prey of all. So basically every nobleman who had his hall or chamber painted made sure to include the picture of a stag-hunt to demonstrate his status as an aristocrat. For that very reason the subject was even more popular among Bourgeois upstarts who, by way of such paintings, laid claim (real or imagined) to participating in elite culture, too. 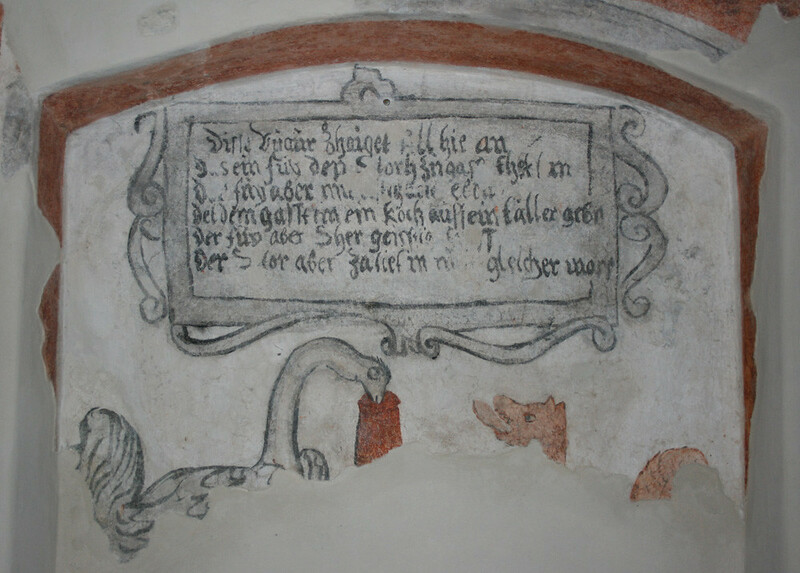 This may explain why in Kaiserebersdorf even the local blacksmith would have wanted it to feature in the decoration of his – for want of a better word – drawing room. We mustn’t forget that a smith’s trade in those days was very well respected and also highly profitable, especially when your workshop was situated on one of the main roads leading into a big town like Vienna. In his own rural community the blacksmith would certainly have been considered a man of wealth and status. For all the medieval traditions that are still at play in the paintings at Kaiserebersdorf, there can be no mistake, however, that they are not medieval paintings. This is perhaps most evident in the hunter pictured above who, as you may have noticed, is actually shooting a rifle! 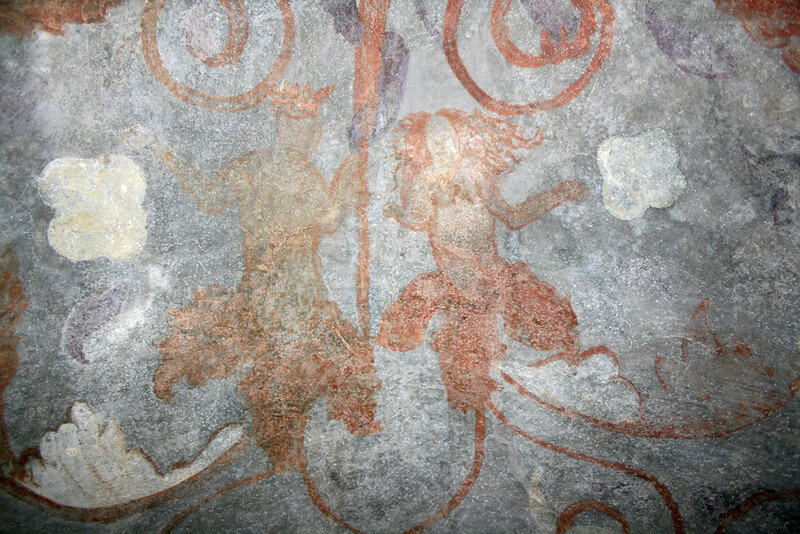 Also, to give another example, among the tendrils in the vaulting there are not only the birds and beasts of medieval custom but also a couple of merpeople, one of them a bare breasted nereid, a motive clearly culled from the art of ancient Rome that had been rediscovered by the artists of Renaissance Italy. In the end, the murals at Kaiserebersdorf present themselves like a kind of hologram or picture-puzzle, demonstrating different aspects depending on the way you look at them. As medievalists we tend to see a lot of things in them that are still medieval, while scholars of early modern art will presumably focus on those elements that are modern and innovative. So, as with most things in life, what we see is very much determined by what we’re looking for, by our pre-established categories of perception. Being able to see and think beyond such categories is, in my opinion, one of the things that make a good scholar – not to mention a desirable human quality in “real life” outside the academic world. I must confess that question made me guiltily cast down my eyes because for most of the conferences I ever attended the answer would have been a big, fat “yes”. So, am I just an academic fraud, prone to attending bogus conferences? After some consideration I dare say “no, I’m not” – what I am is simply an art historian living and working in Europe, as opposed to Notorious Ph.D. who is a historian living and working in America. My point here being that art historical conferences in Europe always tend to take place in one of those cities where all the great art is (think London, Paris, Rome) or, alternatively, at some local research institution in one of those picturesque small towns that come with cobbled streets and timber framed houses, surmounted by the spires of medieval churches. 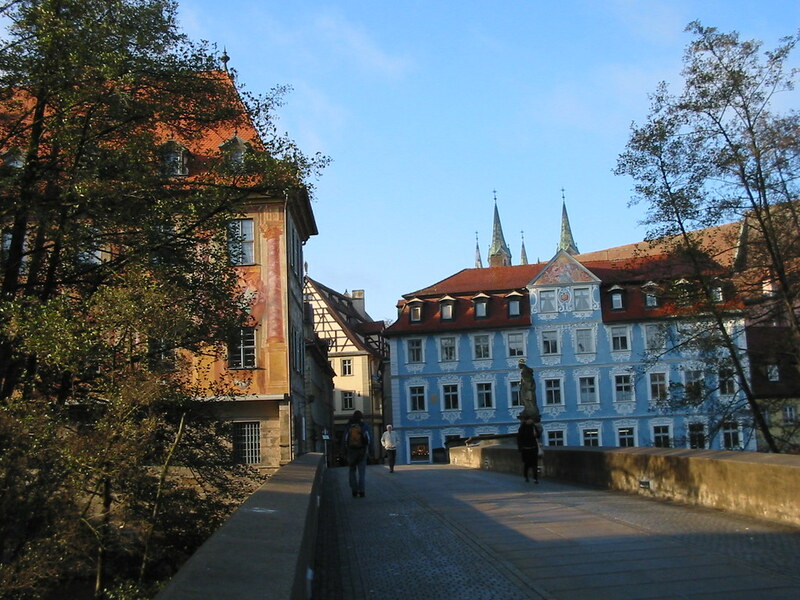 Bamberg, Germany: The Lower Bridge, 3 November 2006, 9:08 a.m. In other words: As art historians we frequently find ourselves in places that most people would consider a suitable destination for a holiday or, at least, a nice weekend trip. No reason to get too excited, though. After all, those are real conferences I’m talking about, which means you do not find the time to be a tourist because you’re sitting in a darkened room listening to conference papers all day long. So more often than not you don’t actually get to see much of your host city no matter how worth seeing it may be. This is one of the reasons why – if the distance allows it – I usually go to conferences by train, more precisely by night train. Traveling that way, of course, you’ll reach your destination at an unreasonably early hour when all the shops and museums are still closed and it’s much too early to check in at your hotel, so all you can do is to drop off your luggage at the station’s deposit, have a quick coffee at the station bar and stroll about the city to take in the sights well before your conference even starts. Marburg, Germany: View from Castle Hill with the spire of St. John's Church ("Kugelkirche"), 9 March 2007, 8:20 a.m.
At such an early hour, though, there’s much more to take in than just the monuments and sights you’ll find listed in the guidebooks. What you’ll witness is the city awakening, slowly wiping the sleep out of its eyes, is wide empty streets filled with quiet at first, then the rumble of a cleaning vehicle washing away the road dirt, the clatter of bartenders and shop owners pulling up the metal shutters that protect their premises overnight, the chatter of parents hurrying their kids to kindergarten before they need to go to work themselves, the clinking of a ladle against a pot as priests and nuns hand out a warm breakfast to the homeless*. 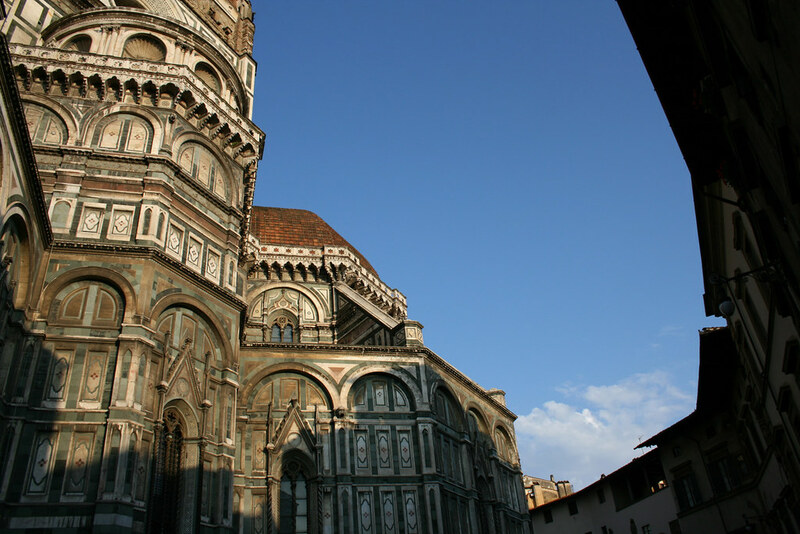 Florence, Italy: Piazza del Duomo, 3 June 2009, 6:48 a.m.
What I love most about that early hour, however, is that special early morning light. 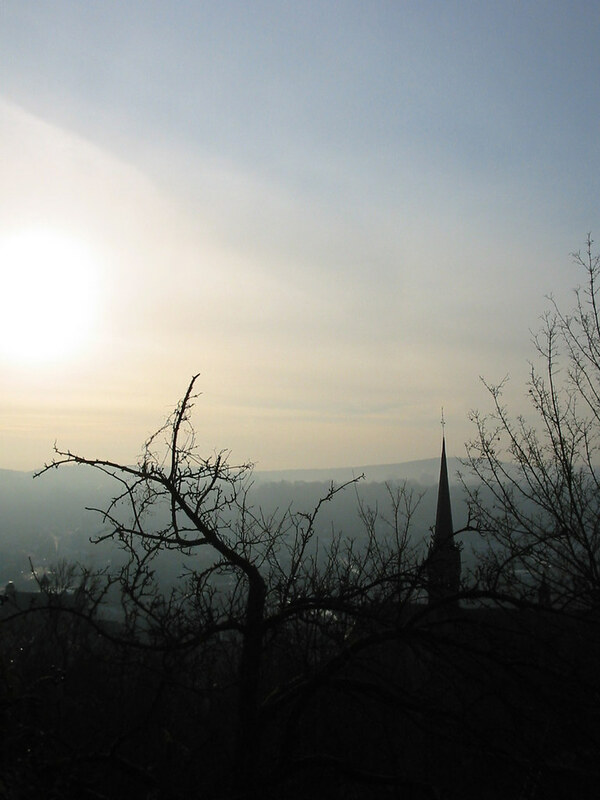 In winter it will be all hazy, seemingly hiding behind a veil of mist, and even in summer it will come with a certain sense of trepidation, gradually emerging into a soft, radiant glow that will be gone once the sun is fully risen. 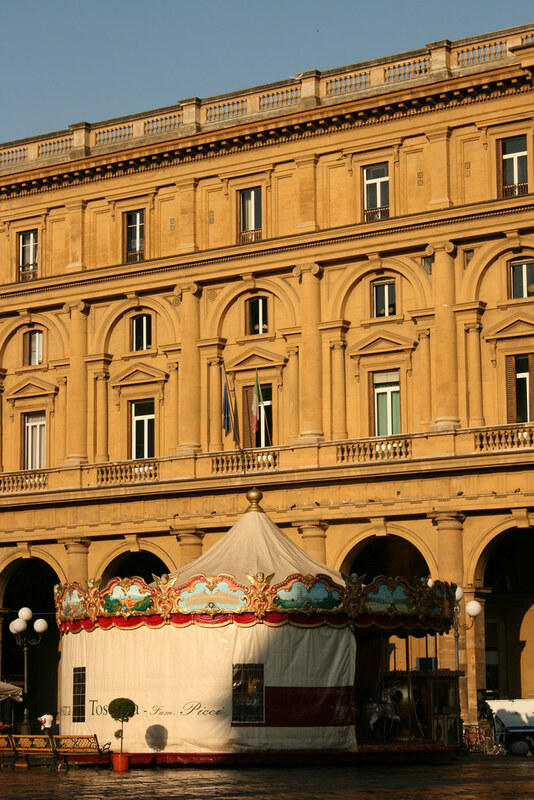 Florence, Italy: Piazza della Repubblica, 3 June 2009, 7:33 a.m.
* Ok, that last one may be a sight you only witness if you happen to pass by the Piazza della Santissima Annunziata in Florence, Italy, at the right time of day. But I guess similar things are to be seen elsewhere, too, though possibly with plain secular social workers instead of clerics.